How to align human and workplace needs for more successful people and organizations. If you’re on a quest to build a better workplace, you’ll need to think about your organization and your people. 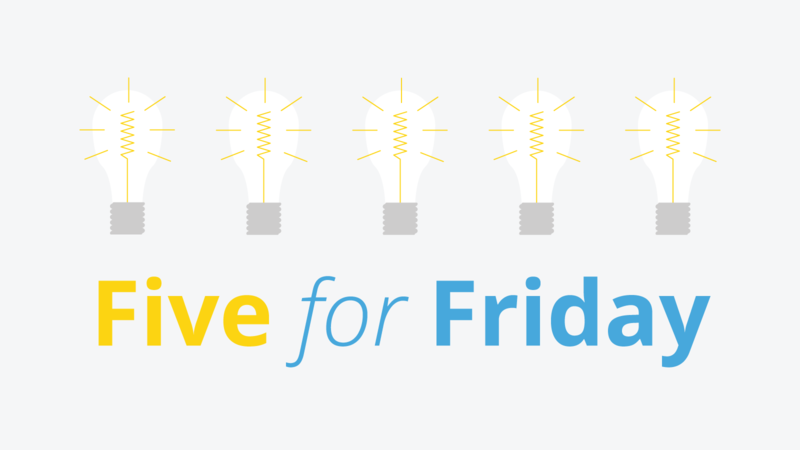 What do your employees need to contribute their best work? What does your business need to succeed? 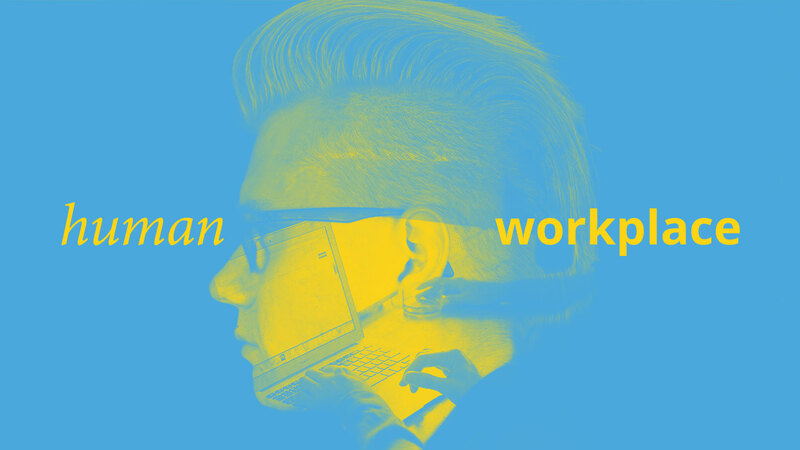 And do you know how to align human and workplace needs? I matter I need to feel that my organization has a worthwhile purpose. And I need to understand how my tasks contribute and matter to this. I belong I need to feel part of the tribe. I need to see workplace values that ring true and that are widely shared as the foundation of a vibrant workplace culture. I’m enabled I need easy access to the tools, information, and processes to do my work. I need clarity on how to find help, get work done, and make decisions. I contribute I need to have my accomplishments recognized. I need to know that my teammates appreciate and value my contributions. I’m respected I need to feel respected. My organization must provide an environment of trust where information can be confidently and appropriately shared. Put simply, when these five emotional needs are met in the workplace, people do their best work, become engaged, and deliver those phenomenal returns that the most successful companies achieve. Purpose – Our organization has a quest. We aren’t just making profit, we’re working towards building something valuable and enduring. Culture – We have shared values and expectations about how things work. We treat each other well and as though we’re one tribe. Clarity – We make clear how the organization works, what needs to be done, the tools and resources we have available, and how we’re making progress. Recognition – We know people work hard and contribute in both big and small ways. We make an effort to recognize these contributions. Trust – Trust is the antidote to fear. When we can trust one another, we can invest in one another and we can help one another excel. 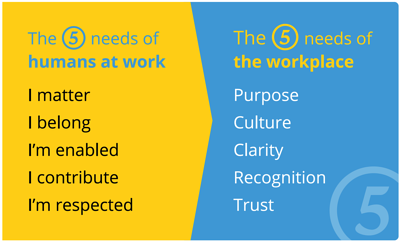 Interestingly, the needs of any organization link closely with the five human needs in the workplace. To build a workplace that supports the five core emotional needs of humans, organizations must focus on developing a workplace that focuses on the five core needs of thriving workplaces. The Jostle® intranet platform helps build stronger businesses by enabling people to be and to do their best. At Jostle we take the time to understand both the key human needs and organizational needs of thriving workplaces. We’ve done our homework, put our findings into practice, and have created a tool that helps build people-centric companies. Our platform facilitates shared communication and collaboration between team members of all levels. It helps companies satisfy the workplace needs of both humans and organizations. A connected team develops and evolves their shared sense of purpose together over time. Effective leadership can refine, reinforce, and illuminate the meaning of the team’s mission by showing how it impacts decisions and the world in general. People know the work they do makes a difference, so they do their best. With the Jostle platform, everyone stays connected through the real-time sharing of updates and information necessary to achieve goals. Culture is the daily aggregation of interactions. Culture is how we treat one another; it’s the expectations we share about the way we get work done, or how and why we communicate and share ideas. It’s how we invest in one another and the world around us. The daily stories, challenges, and solutions we share as a company make us feel part of and define its culture. 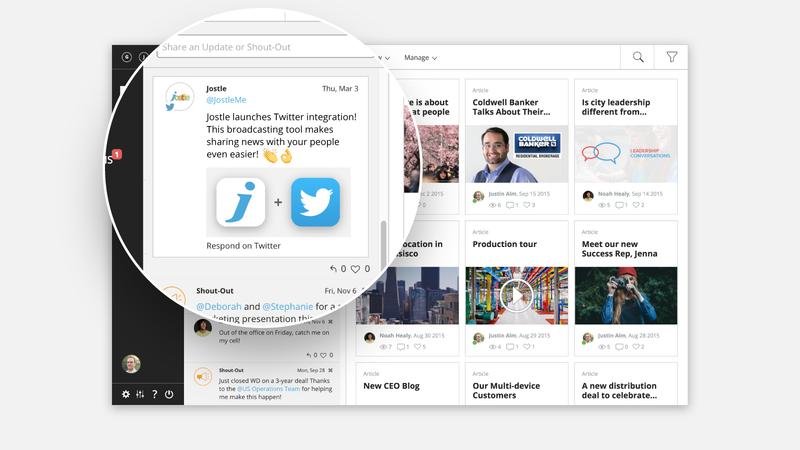 The Jostle platform’s NEWS view helps your employees post the stories and anecdotes that contribute to your company’s culture. Who works here? What do they do? What resources do I have? What tools and information are available? How do I get help? How does this all fit together into a big picture? The Jostle platform’s LIBRARY, TEAMS, and PROFILE views in conjunction with DISCUSSIONS and NEWS views help everyone maintain a clear view of what needs to be done, how to do it, and how it’s going. Saying “thank you” is the simplest and most powerful way to show people that you appreciate their work. Doing it in public is even better. The Jostle platform helps build esprit de corps by creating a great place to send a “Shout-Out” to people who’ve done something that made a difference. Trust is what happens when people understand that they win or lose as a team. Trust happens when people value helping one another more than than outshining one another. It’s what happens when people are helpful, honest, and consistent. This starts with leadership. Great employee communications help leaders consistently demonstrate their commitment to trusted behaviors. Research shows that people in organizations will follow their leaders in these behaviors. Daily discourse on the Jostle platform is an excellent way to demonstrate the kind of behaviors you want in your organization and encourage others to do the same. Organizations are made up of humans—humans with specific emotional needs that must be nurtured in order to work and collaborate effectively. Successful companies must address the five human needs while simultaneously addressing the organizational needs of purpose, culture, clarity, recognition, and trust in the workplace. When the needs of humans are tended to and the needs of the workplace are prioritized at the same time, great things can happen. Do you want to build a great workplace?